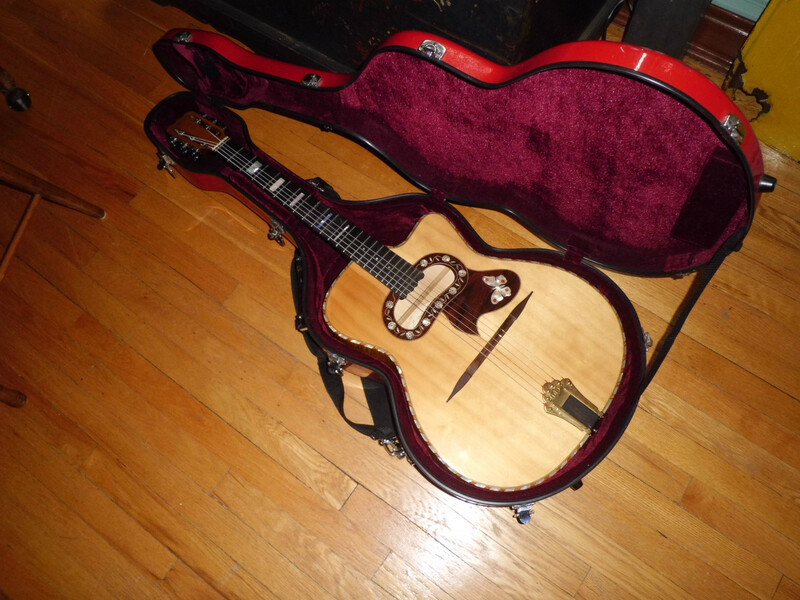 This is Claude Patenotte’s flagship model guitar. It features laminated maple back and sides, linden neck, and an ebony fingerboard. The bean shaped soundhole has Pattenotte’s characteristic “frowning” contour with a highly ornate flower themed rosette. 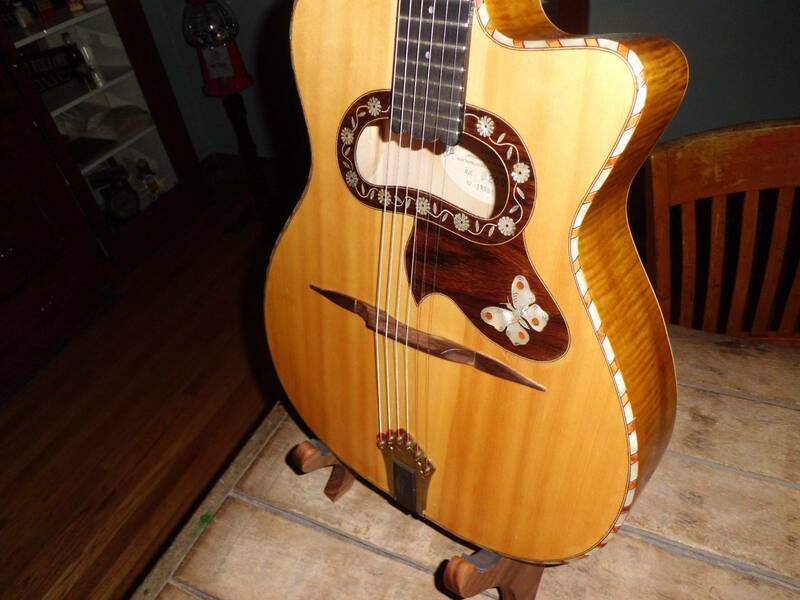 Additional ornamentation includes MOP butterfly inlay on the pickguard, MOP block fingerboard inlays, and MOP rope binding. This all adds up to one stunning guitar! Soundwise this guitar is quite special! This instrument doesn’t suffer from the problems that plague so many lesser guitars: excessive overtone ringing, muddiness, lack of projection, thinness of tone, etc. Rather, it is very rich and thick in tone with enough projection to fill any room with ease. It has the sort of tonal character that you never find in factory made guitars, which sound dull and lifeless by comparison. It’s focus is in the mids, which growl with attitude while the highs are nicely rounded and pleasing. This instrument responds particularly well when played with a heavy pick and attack in the traditional Gypsy style. The more you give it, the more you get! Additionally, the shorter scale will appeal to those looking for something more ergonomic. Posted by Michael Horowitz on February 2, 2014 at 11:01 pm in Patenotte.